From the very beginning of the Buddhist tradition, the reason people have practised its teachings has been through the desire to be happy. It is so simple that it almost sounds shocking. What the Buddha discovered about the nature of mind and the world brought him freedom, understanding and complete contentment. His teachings share this understanding with us, allowing us to find the same timeless peace and happiness ourselves. 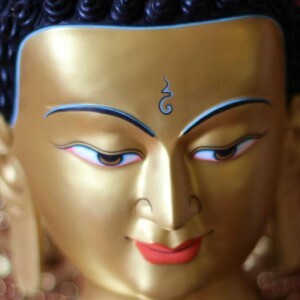 That is what Buddhism is about – going from a state of suffering, discontent and frustration to a state of happiness. The understanding the Buddha came to was not something unique to him. He expressed this by saying: “All beings possess buddha nature”. All beings possess a mind. They are therefore capable of attaining enlightenment and discovering the true, lasting source of happiness. Buddha nature, the potential to become enlightened, exists in everyone – men and women, young and old, even in non-human beings such as animals. It does not matter how confused we might be or what suffering we might have endured. Nor how intelligent or unintelligent we may be. We each have the same potential to awaken to the presence of the timeless qualities of compassion and wisdom within us. All the teachings and practices of the Buddhist tradition are simply the means to help bring that about. Find out more about the way of the Buddha – What is Buddhism?